Usually, when violin people talk about comparing Stradivaris and Guarneris they're talking about comparing the violins of Antonius Stradivarius and Joseph Guarnerius 'del Gesu'. BUT not with cellos! Why? Because as far as the violin world knows, del Gesu didn't make any cellos! (An important aside- There's one Joseph filius Andrea labeled cello from 1731 that many people believe shows all or at least some work by del Gesu. But that's it. Just one. Well, maybe two. Watch the video below with the Australian Chamber Orchestra's Guarnerius cello.) So we compare the contemporaries of Stradivarius in the Guarnerius family- Andrea, Joseph filius Andrea and the two Pietros, one of Mantua and the other of Venice. Yes, that's a lot of Guarneris. Stradivarius lived a long time! The Guarneri family and Stradivari definitely had different clienteles. Stradivari made instruments for many of the royal houses of Europe. The Guarneris were making instruments for troubadours and different types of string "marching bands". Look at the above video at 1:08. See the circle of darker wood towards the center of the back? That's where a troubadour cellist once drilled a hole into the back of the cello so that a holding peg could be put into the cello and then attached to a shoulder strap. Surprisingly, fairly similar to the shoulder straps for NS Design electric cellos.The Guarneris never attained the recognition or noble patronage of Amati and Stradivari, so for the most part, they worked with lower quality materials. Generally, the cellos made by the Guarnerius family are somewhat shorter in body length but much higher arched than Stradivaris. What's the arch? In instrument making, the arch is the term we use for the curves that are shaped into the instrument's top and back. A higher arch means the top and back rise higher from the edge. In simple terms, a higher arched instrument is fatter. A high arch often means the instrument will have a sweeter sound but not project as well. Stradivari's long career meant that his cellos underwent many changes. His early cellos, made in the late 1600s, mostly followed a large design and were often bass cellos that had five strings and could be tuned down into the bass range. These huge cellos were about 790mm in length! (Cellos are Big. They Used to be Bigger ) Cellos in that time were used almost exclusively as basses, so while they were musically crucial, they were rarely soloists. Musicians would rarely use the register above 1st position, so a large instrument was perfectly functional. But with the invention of wire-wound strings, a wire string with a catgut core, a finer bass sound was possible. At the same time, a generation of cello composers and performers emerged, including Giuseppe Maria Jacchini and Domenico Gabrielli. Their compositions, which featured cellos as soloists, demanded an adapted cello with a shorter body stop length and a narrower body. Andrea Guarneri is thought to have been one of the first to adopt a smaller form. Stradivari was slower to adapt, only making smaller cellos in the late 1690s. 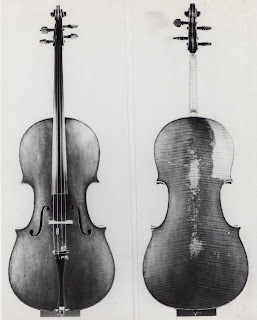 One of the first examples is the 1700 'Cristiani' cello has a back of 766mm compared to the 792mm of the 1690 'Medici'. In around 1707, Stradavari somewhat standardized the smaller cello dimensions and these cellos are collectively referred to as 'forma B' cellos. The 1711 'Duport', which allegedly has marks from Napoleon's spurred boots, is 755mm in length and is much narrower than Stradivari's larger form cellos. These cellos were usually under 762mm, or 30 in., in length, had narrower outlines, taller ribs, and a shorter body stop. Many modern luthiers use dimensions vaguely based on 'forma B' for their cellos. Later, Stradivarius, likely with the help of his son Francesco, reduced the size of his cellos even more to create the 'forma B piccola'. An example of this would be the 1730 'De Munck', which has a back length of 746mm. Only 6 'forma B piccola' cellos and 20 'forma B' cellos exist today. What a 'body stop' and 'neck stop' look like on a modern violin. Cellos vary quite a bit but the neck length is usually about 280mm and the body stop is about 395 to 400mm. The Guarneris: Andrea, Joseph 'filius Andrea', and the 2 Pietros all made some cellos. Andrea Guarneri was one of the first luthiers to make some smaller violoncellos, though he did make larger model cellos for the most part. 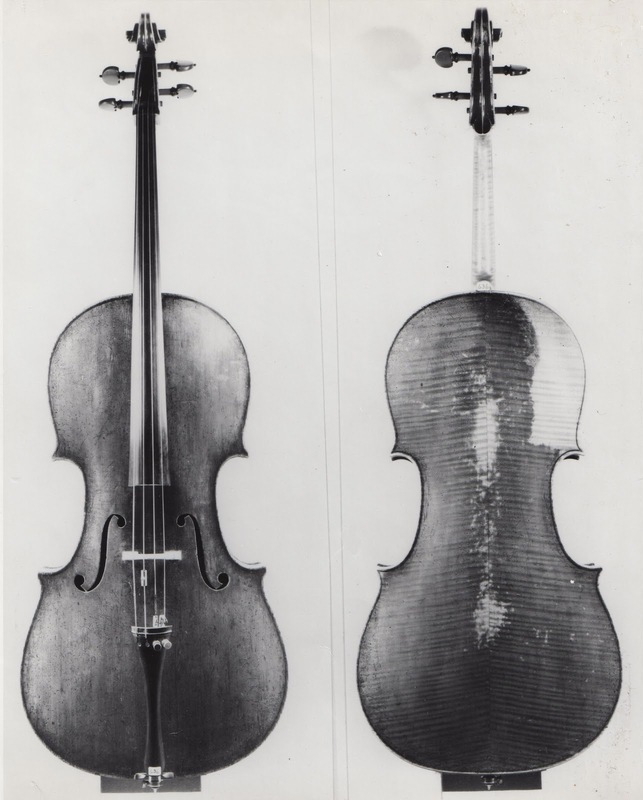 His 1669 'Soyer' had a back length of 754mm despite being created 30 years before Stradivarius' first smaller cello the 'Christiani'. His cellos are praised in the Hills book The Violin Makers of the Guarneri Family for having good f-hole placement and beautiful scrolls. Altogether, Andrea Guarneri made only 14 cellos that we know of. Andrea Gaurneri's son, Pietro of Mantua, also made instruments, although fewer, since he was both a musician and luthier. Only one of his cellos survives today, and is played by Ronald Leonard. He bought it in 1964 and has had it ever since. He says it is "not huge-sounding, but it projects very well, and it has a beautiful core to its sound" it has "a uniqueness of sound which I find very appealing". Though he was given the chance to play the 'General Kyd' Stradivarius cello as the LA Philharmonic principal cellist, he passed it up and continued playing his Guarneri cello. Pietro of Mantua's instruments in general are very highly regarded and are very rare. His younger brother Joseph 'filius Andrea', who eventually inherited the Guarneri workshop, also made violoncellos which are exceedingly rare today. One of Joseph filius Andrea's cellos, made in 1729, is played in The Australian Chamber Orchestra and shows distinctive hand work from Guarnerius del Gesu. Joseph's (filius Andrea) instruments are considered of better quality than his father, Andrea. His cellos are often recognized as the work of a master, but as with all Guarneris, he is and was overshadowed by Stradivarius. Hear Australian Chamber Orchestra cellist Timo-Veikko Valve play the orchestra's 1729 Guarnerius cello. Joseph's older brother, Pietro of Venice, was supposed to inherit the shop, but moved to Venice in order to escape the Stradivari dominance in Cremona. His 1739 'Beatrice Harrison' cello was praised by the great 19th century cellist Antoine Vidal as "[entitling] Pietro Guarneri to be placed amongst the great Italians". He is praised for combining Cremonese and Venetian styles well, using a Strad-like form with edging and corners based on his father's work, and a Venetian red varnish. Today, it is rare to see even a historical cello of 'Medici' dimensions, as almost all the old Stradivarius cellos have been cut down to modern dimensions to make them more playable. Only three unaltered large form cellos remain, the 'Medici' in the Instituto Cherubini of Florence, the 1699 'Castelbarco' which is in the Library of Congress, and the 1701 'Servais' at the Smithsonian. The 1696 'Lord Aylesford', often thought to be one of the uncut Stradivarius cellos, since it has an incredible length of 794mm, was probably reduced in dimensions by Henry Werro. The great cellist Janos Starker played on the 'Aylesford' for 15 years. Here's his description from seeing it in Werro's shop, "I visited Henry Werro in Bern, the luthier who had eventually purchased [the 'Lord Aylesford']. As he was unable to find a buyer for it, he had decide to reduce its size. When I looked at my partner of 15 years, I felt sick. I ran away from Werro's shop and never saw him or it again." What do you hear when comparing the various Stradivarius and Guarnerius cellos? Generally, the Stradivarius cellos are considered more "soloist" instruments. But with the right player and the right set up, many of the Guarnerius instruments produce an incredibly sweet sound that can still fill a concert hall.